What If You Were the Leading Source? The Gallup World Poll has become an indispensable tool for global thought leaders and decision-makers. Use data to make a difference. Gallup works with Sustainable Development Solutions Network to share the stats on the world's happiness. By uncovering how factors such as GDP per capita, social support, life expectancy, freedom to make life choices, generosity and corruption levels affect an individuals' happiness levels and which countries are the happiest, we are helping SDSN meet their goal of accelerating joint learning and promoting approaches that address the economic, social and environmental challenges confronting the world. "Happiness can change, and does change, according to the quality of the society in which people live." We partner with the Food and Agriculture Organization of the United Nations to gather and share information about food insecurity. By measuring the amount of people worldwide who suffer from hunger, their goal is to progress toward the human right to adequate food. The World Bank asked us to gather data for the Global Findex, the world's most comprehensive database on financial inclusion. As of our 2017 study, 69% of the world's adult population had bank accounts. The more people with bank accounts, the better the world's citizens can safely store their money, manage risks, and access credit when needed. of the world's adult population had bank accounts in 2017. Gallup works with Walk Free Organization to gather and share information about modern slavery. By uncovering the number of people across the globe who are affected by modern slavery, we are helping Walk Free meet their goal of ending modern slavery in our generation. Within one month of the 2018 release, the index achieved over 100,000 Twitter impressions. 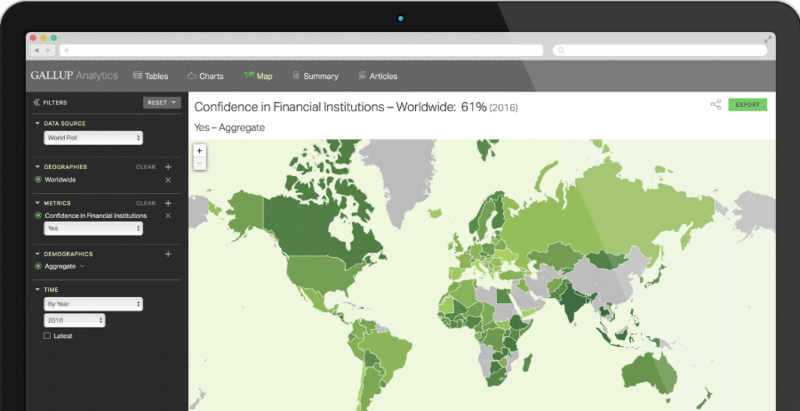 Gallup works with MetLife Foundation to gather and share information about financial control worldwide. By revealing global perceptions about financial security and control, we help MetLife Foundation and their partners help millions of people take meaningful steps forward to more financially healthy futures. The study interviewed more than 15,000 people in 10 very different countries to find out how to help people lead more financially healthy and secure lives. Our insights inform media stories and thought leadership all over the world. We can help get people talking about your project. What's the most generous country on earth? The Gallup World Poll exists to help change the world by finding out what each of the world's 7 billion+ citizens think, feel and desire. And we're the only ones in the world who can reach every person on the planet. We partner with Fortune 500 companies, foundations and think tanks to help them become thought leaders on the key issues that affect their industries and our global societies. What's in the World Poll? From happiness to financial inclusion to modern slavery to your custom questions, we get the data on every subject that matters. Together, we influence lives. Read the stories. Globally, Negative Experience Index reaches new high in 2017. We go beyond data collection. Partner with us from the idea phase of your project through analyzing and publicizing your results. Search, analyze and export data for your research project using Gallup's proprietary database. Learn More about Gallup Analytics. Gallup Analytics houses nearly 12 years of international data from more than 160 countries. Become a thought leader today. Get in touch with a Gallup expert to find out about our work and rates.